Get Extra 10% Off MLB Merchandise at Kohl's! You are here: Home / Great Deals / Get Extra 10% Off MLB Merchandise at Kohl’s! Get Extra 10% Off MLB Merchandise at Kohl’s! Baseball season is under way. Be sure to show your support with MLB merchandise! 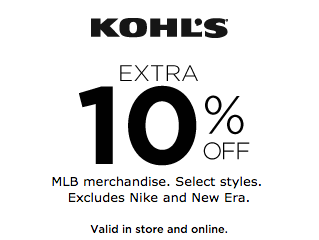 This weekend you can Get an Extra 10% Off MLB Merchandise at Kohl’s with an in-store coupon or an online promo code!